Given the extraordinary scope of the current economic crisis, no single policy can fully address the challenge of job creation. The American Recovery and Reinvestment Act has spurred job creation substantially, but the deterioration in economic prospects since it was passed demands a renewed focus on job growth in the near term. A well-designed temporary federal job creation tax credit should be an integral part of the effort to boost job growth.1 Besides having broad-based, bipartisan political support, the best argument for a job creation tax credit is simply that it will create almost 3 million jobs in 2010 and over 2 million in 2011. Moreover, it will stimulate the entrepreneurial character of Americans by giving 6.5 million employers and millions more aspiring entrepreneurs a limited-time offer to expand their production or start new endeavors, at a discount. Because choices about whom to hire and what work they should do are left to independent decision makers who can act immediately, the credit will have just as quick an impact. A job creation tax credit that refunded 15% of new wage costs in 2010 and 10% of new wage costs in 2011 could create 5.1 million additional jobs in the U.S. economy over these two years. The net cost of the tax credit would be roughly $27 billion, or about $5,400 per new full-time-equivalent job created over these two years. The recession now under way is more severe than any since 1929. The collapse of the housing bubble and the financial panic of 2008 delivered a more intensive shock to the economy than the busts that initiated the Great Depression in 1929. In just 12 months from December 2007 to December 2008, household wealth fell 17%—five times the rate of decline during 1929. For months it seemed not unlikely that even industry leaders like General Electric and Chesapeake Energy might default on their debt. Expecting a decline in demand and limited access to credit, businesses raised cash by ruthlessly cutting their work forces, reducing inventory, and postponing planned expansions. Only massive government intervention—the reduction of short-term interest rates almost to zero, innovative quantitative easing programs (Federal Reserve policies to free up credit that go beyond ordinary monetary policy), and big increases in government spending —prevented the economy from spiraling down into a great depression. Yet the recession has been much deeper than what was forecast when the planning for these efforts took place at the end of 2008 and early 2009. From the beginning of the recession in December 2007 until September 2009, the latest month of data, the employment-to-population ratio for persons 16 and over in the United States fell from 62.7% to 58.8%. Further, total hours worked in the private economy have fallen 8.6% as 8.0 million workers have lost their jobs and another 4.5 million have been forced to take part-time work because full-time work is not available. Even if a recovery in economic output is already under way or will be soon, the employment-to-population ratio is unlikely to return to its December 2007 level for several years. In the past two recessions (1990-91 and 2001), the employment-to-population ratio did not increase from its lowest level by any significant extent for at least two years. Economists surveyed in September 2009 remain mostly pessimistic about the prospects of a strong rebound for jobs—they forecast nonfarm payroll growth of only 17,000 jobs a month over the next year. To put this number in context, more than 125,000 jobs are needed each month just to keep the unemployment rate from rising (Bernstein and Mishel 2008). Today the Congressional Budget Office projects an unemployment rate of 10.2% in 2010, 9.1% in 2011, and 7.3% in 2012. In other words, in three years the unemployment rate will be about where it was in the middle of the recession.Clearly, job creation should be a top priority of policy makers right now, and a job creation tax credit is an efficient and effective policy option. The job creation tax credit would be a refundable tax credit available to employers who expand the portion of their payroll that is subject to Social Security tax in 2010 and 2011. The tax credit would equal 15% of additions to taxable payroll in 2010 and 10% in 2011. The reduction in the second year is a response to two assumptions. First, improved employment conditions in 2011 will reduce the need for the credit. Second, as conditions improve employers who would have expanded in the absence of the credit will still be able to take advantage of it, so reducing the second year credit helps control its cost. Moreover, the higher credit in 2010 encourages employers to front-load their hires. What is the credit based on? The credit is paid on increases in total payroll subject to Social Security taxes. So firms could receive the credit for adding new jobs, adding hours for existing workers, or simply raising pay. Further, because the credit is based only on that portion of payroll subject to Social Security taxes, wage increases given to very highly paid workers (those whose earnings exceed the Social Security tax threshold of $106,800 in 2009) would not be eligible for the credit. What is the base period to which payrolls in 2010 and 2011 will be compared? The credit would be provided for any payroll expansions (not just new hires, as mentioned above) in a quarter relative to the same quarter a year ago. The credit could be claimed for payroll expansions relative to the base period starting in the first quarter of calendar year 2010. At the end of March 2010, employers would receive a tentative quarterly jobs credit based on how much their first quarter payroll exceeded their payroll during the first quarter of 2009. The tentative jobs credit for the second and third quarters of 2010 would be based on comparisons with the corresponding quarters of 2009. The tentative credit for the fourth quarter of 2010, however, would be based on a comparison with the fourth quarter of 2008. The quarterly approach means that firms get their estimated jobs credit soon after paying their workers, thus providing relief for firms with cash flow problems. The approach also provides a natural way of handling the seasonal variation in employment levels. The tentative amounts for each quarter and the actual amounts for the year would be reconciled based on the firm’s annual tax return. The plan avoids using the fourth quarter of 2009 because it is likely that Congress will be considering this proposal during that period and so firms might have an incentive to cut employment before the start of the credit. Also, because new jobs added during November and December 2009 will not raise the baseline employment and payroll numbers to which 2010 and 2011 will be compared, people hired during those months will give the firm a running start on expanding their employment levels during the first quarter of 2010. Employment expansion should be encouraged in as many sectors of the economy as possible. A broadly based employment expansion provides a greater variety of job opportunities for the unemployed, and all employment expansions provide a boost to economic output and tax receipts. But for the credit to be broadly available it must be “refundable,” that is, available at full value even to businesses that have no corporate or personal income tax liability as well as to non-profit organizations and state and local governments. But any firm receiving the credit would need to be in a trade or business. This requirement means that families who directly employ nannies, tutors, housekeepers, and gardeners would not be eligible, but companies that provide landscaping, cooking, child care, and home health services would be. How can the credit be implemented quickly? Almost all U.S. employers currently file Form 941 to report their liabilities for Social Security and Medicare taxes and income taxes withheld for their employees. Adding a few lines to the form would allow a wage credit to be implemented relatively simply and quickly. Appendix D provides a brief discussion of one possible design for a wage credit program using Form 941. 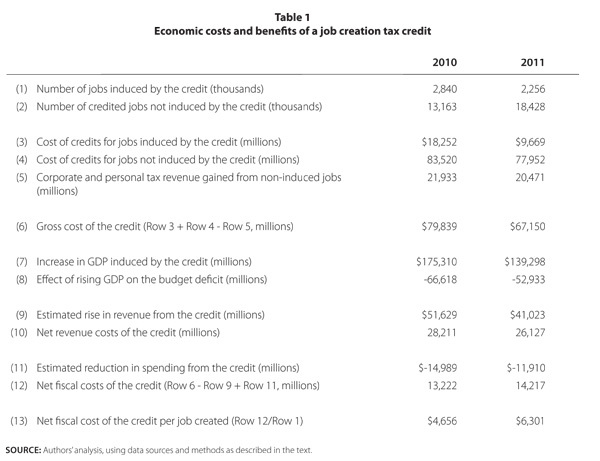 The costs and benefits of the job creation tax credit are summarized in Table 1. We estimate that in 2010, 2.8 million jobs will be created by the credit, followed by 2.3 million in 2011. The net budgetary costs of the program are $13 billion in 2010 and $14 billion in 2011. The remainder of this section walks through the rows of Table 1 to provide a summary of how each number was calculated. Full details on the economic parameters and assumptions that generate the data in Table 1 are provided in the appendices. The economic literature finds that a 1% decline in labor costs is associated with a 0.3% increase in demand for new hours by employers. (This is based on the authoritative book by economist Dan Hamermesh, Labor Demand). Only those employers who add to payrolls (whether in the form of new jobs or added hours or raises for current employees) will be able to take advantage of the credit, and data compiled by the Bureau of Labor Statistics (BLS) indicate that just over 60% of employment is in firms that are likely to do so. (See Appendix H for more information.) Even in a troubled economy, there is a wide diversity of growth and contraction among employers, and many employers will be in a position where the credit offers a meaningful incentive. Given these assumptions, the percentage increase in payrolls spurred by the credit can be calculated as: 60% (share of employment utilizing the credit) multiplied by 15% (the size of the tax credit) multiplied by 0.3 (the best estimate of the responsiveness of employer hiring to a 1% change in labor costs), or a 2.7% increase in the economy’s total payroll. A payroll increase of 2.7% represents a roughly $175 billion increase in total labor compensation. Given that the average full-time equivalent employee earns $62,000 in compensation, this translates into roughly 2.8 million additional jobs for that year. Doing the same exercise for 2011 yields 2.3 million jobs in that year. Note that we calculate the change in full-time equivalent jobs. Because the average hours worked per week in the U.S. economy are less than a full-time equivalent, the actual number of new jobs would be greater. Data from the business employment dynamics (BEDS) program of the BLS show that expanding private-sector establishments experience employment gains that are equal to roughly 10.6% of total economy-wide employment in a given year. We use this as our measure of new jobs that would receive the credit that would have been created even in its absence. So, in 2010 roughly 13.2 million jobs are projected to receive the credit that would have been created anyway. This number is larger over the two-year period ending in 2011. If the 2.8 million jobs induced by the credit in 2010 pay the economy-wide average annual wage covered by Social Security of $43,000, then the wage credits for these jobs will cost $18 billion in that year. A similar calculation yields $10 billion in 2011. If the 13.2 million jobs that receive the credit in 2010 that would have been created even in its absence pay the economy-wide average annual wage of $43,000, then the credit for these jobs will cost $84 billion in that year. A similar calculation yields $78 billion in 2011. For firms that receive the credit for new jobs that would have been created anyway, the tax credit then directly increases business profits, and this increase in profits would be taxed. We assume that the statutory corporate profit tax rate of 35% and the non-corporate profit tax rate of 27% apply to the private sector, for-profit employers whose profits increase as a result of the credit. The increase in profits of these employers results in roughly $22 billion in additional revenue generated through corporate (and non-corporate) income taxes in 2010 and $20 billion in 2011. Adding up (1) the cost of jobs induced by the credit and (2) the cost of providing a credit to those jobs not induced by the credit, then subtracting (3) the offset provided by the direct increase in employer incomes that the credit makes possible on those jobs that would have been created anyway yields the gross cost of the credit (i.e., the cost before taking into account the offsets created by the job growth that it spurs). This means that the cost of the credit for jobs that would have been created even without the credit is $62 billion ($84 billion minus $22 billion). To this, we add the $18 billion cost of the 2.8 million jobs directly created by the credit, leaving us with an $80 billion gross cost in 2010. The gross cost of the credit identified above will be substantially offset by the economic activity (i.e., employment) that the credit spurs. Assuming that each new job created generates an addition to overall GDP that is equal to the economy-wide average in labor compensation ($62,000), the 2.8 million jobs created by the credit will boost gross domestic product by $175 billion in 2010. Data from the Congressional Budget Office (CBO) indicate that every dollar increase in GDP reduces the budget deficit by 38 cents. Rising GDP results in both increased revenues for the government as income is taxed as well as reductions in the need for safety net spending as more people find sustaining work. The $175 billion increase in GDP spurred by the credit thus translates into a $67 billion decrease in the budget deficit in 2010 and a $53 billion decrease in 2011.
nues. This implies that the credit will increase revenues by $52 billion in 2010 and $41 billion in 2011. In 2010, the additional federal revenue spurred by the job credit from its effect on overall GDP means that the credit’s net revenue costs are knocked down to $28 billion in 2010 and $26 billion in 2011. In 2010, another $15 billion in deficit reduction will occur due to reduced need for safety net spending as the result of higher employment and GDP. These spending reductions will reduce the deficit by $12 billion in 2011. Subtracting these spending reductions from the net revenue costs yields the net fiscal costs of the credit: $13 billion in 2010 and $14 billion in 2011. Dividing this net fiscal cost by the number of new jobs created means that each new job created by the credit costs $4,700 in 2010 and $6,300 in 2011. While the official trough of the longest recession since World War II may be here or near, it is clear that conditions in the labor market will be dire for years. The CBO has forecast that not until 2014 will the economy return to the pre-recession unemployment rate of 4.7%. Why would we accept this? Policy makers must make robust job growth a top priority. The job creation tax credit can boost us out of this recession quickly and at a modest cost. It empowers 6.5 million employers to take the expansion plans they put on the shelf in November 2008 and start implementing them as soon as January. The credit should be a key part of the policy mix if for no other reason than that it is especially effective when compared to other tax breaks offered to business in the name of job creation. Its effectiveness stems from its straightforward design: businesses only get the credit if they increase their payrolls, either through adding jobs, adding hours, or raising wages. Its effectiveness also makes its net costs cheap. In short, it belongs in a legislative effort in the near term to create jobs. — Timothy J. Bartik is a senior economist at W.E. Upjohn Institute for Employment Research, Kalamazoo, Mich.
— John H. Bishop is associate professor of Human Resource Studies at Cornell University, Ithaca, N.Y.
A number of questions/criticisms have been raised about the issue of a job creation tax credit (JCTC) and job creation. We address some of them in this appendix. Given the current economy, why will firms expand in response to this program? While it is true that the roots of current labor market woes run deep, it remains the case that, even in a depressed economy, employers face a variety of economic situations; some employers will expand in response to a marginal cut in the cost of hiring. Standard economic logic about marginal decision making says that the JCTC will tip many decisions in the direction of more hiring. That is what the many econometric studies of the constant output demand for labor reviewed and summarized by Daniel Hamermesh demonstrate. Let’s start with the effect of the JCTC on the cash flow of firms that, despite the recession, boosted sales and employment enough to allow them to take advantage of the refundable job credit. 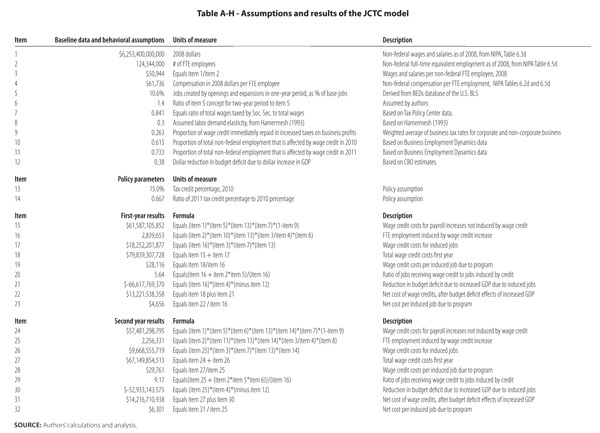 The JCTC has both income and substitution effects. The income effect is a targeted reward (a quarterly rebate that quickly supplements cash flow) of companies that increase their payroll above the level that prevailed in FY2009. Firms that have sufficient demand for their output but face difficulty getting working capital from their banks are quickly assisted when they increase hours and employment. By expanding at a time of 10% unemployment, these employers pursued risky expansions in troubled times that created substantial positive externalities for fellow citizens. For this we should be grateful rather than worried about the reward they receive from the JCTC. The JCTC-induced increase in jobs and payroll will tend to increase demand for output. The increased cash flow to firms, even those that were not induced into hiring by the credit, will also generate income effects. Mark Zandi, a macroeconomist at Moody’s Economy.com, has estimated that a broad-based payroll tax “holiday” has high “bang-for-buck” even graded strictly as macroeconomic stimulus when compared to many other policies aimed at shortening the recession. The JCTC is similar (though not identical) to a payroll tax holiday and should have similarly good properties simply as macroeconomic stimulus to demand. The Keynesian demand effect thus tends to validate the expansion plans the JCTC’s incentive effects generate. Consumers have decided they must stop spending beyond their means. How can reductions in the marginal cost of labor solve a problem of insufficient aggregate demand by domestic customers? • Increase exports—Demand is growing rapidly in emerging economies. American exporters become more competitive because they can give temporary discounts to close a deal. The fact that discounts will disappear in 2012 may aid the exporter in closing the deal. Buy our locomotive (or industrial crane or combined cycle generator) now while it is on sale. • Reduce imports and offshoring—Prices of domestically produced goods and services will fall relative to import prices. This will increase the U.S. produced share of value-added in final demand, creating more jobs or longer work hours for domestic workers. Firms may also choose to postpone offshore outsourcing. The postponement may continue after the JCTC expires as emerging market currencies rise against the dollar and wages of English speakers in emerging economies rise. • Raise service quality—Some firms will try to attract customers by improving the quality of services they offer (generally in ways not measured by the BLS). Firms might, for example, shorten wait times or improve the training of sales staff so that they can better assist customers. • Push down prices and raise domestic demand by cutting labor costs—A temporary 15% reduction in the marginal wage-and-salary cost of labor throughout much of the economy will temporarily reduce prices of the goods and services these workers provide. Bishop and Havemen (1979) and Bishop (1981) concluded that the 1977-78 new jobs tax credit (NJTC) lowered retail inflation. Sales and promotions offering introductory rates for ongoing services are likely to become more aggressive. Despite the problem of insufficient aggregate demand, the temporary two-year reduction in prices will increase real sales and output and help validate the increase in employment stimulated by the JCTC. ence that investing in new products and services will be profitable? We think there are several reasons to think that a JCTC can help increase employers’ confidence that expanding employment will pay off. • Investments are labor intensive during the research, development, and construction phase—Firms that repair roads or build new capital equipment typically expand staff when they win the contract and so will benefit from the JCTC. R&D is also a people-intensive activity that is often contracted out to specialized firms that might receive the JCTC when they win a contract. The subsidy provided by the JCTC will lower the cost of contracting with R&D and construction contractors and this should stimulate these activities. • The JCTC rewards investments in people—Most of the costs of in-house training are the time of the workers being trained. Companies qualifying for a JCTC subsidy can receive even larger rebates when workers spend more time in training. • The JCTC underwrites expansion into new markets—Expanding into new markets is also a risky, people-intensive way of growing a company (e.g., recruiting sales personnel in unserved markets). A temporary JCTC says, do the expansion now while the talented workers are available and generate a tax credit for yourself in their first year. Having talented people is what creates long-run sustainable advantage for small firms. Hopefully, competitors will realize that a firm using the JCTC is stealing a march on them and so they will rush to try to do the same, thereby restoring the economy’s animal spirits (Akerlof and Schiller 2009). Again, a JCTC should not be the only policy enacted to spur job growth in the near term—it should be supplemented by other measures to boost demand. But, to the extent that this incentivizes employers to add jobs and/or relieves credit constraints that are keeping some employers from expanding employment as much as they’d like, it could make a real contribution to job growth. Tax credits for new jobs have been tried before, and they worked well. A “new jobs tax credit” (NJTC) was passed by Congress and went into effect for 1977 and 1978. It provided a credit to reduce tax liabilities of for-profit businesses that expanded payroll and employment. In today’s dollars, the tax credit amounted to around $7,000 per new hire, which was roughly 14% of average U.S. wages and salaries for full-time employees. The credit was capped by not letting businesses claim the credit for more than 48 additional employees. In 1976, the second year of expansion coming out of the 1974 recession, growth had slowed to an anemic 2.9% for employment and 3.1% for output. During the subsequent two-year period during which NJTC was in operation, private employment rose 11.1% (a record for the past 50 years). The two-year percentage increase in the employment-population ratio and in total hours worked in the non-farm economy (10.9 %) are also records for the past 50 years. By the final quarter of 1978, capacity utilization had spiked, real output had increased 15%, and unemployment had dropped from 7.8% to 5.9%. Formal evaluations suggest that the 1977-78 NJTC was quite successful, creating 700,000 jobs by February 1978 and probably many more by December 1978 (Perloff and Wachter 1979; Bartik 2001). These evaluations rely in part on surveys showing that businesses that knew about the NJTC were more likely to expand than businesses that did not know about the NJTC. In addition, industries with more small businesses, which particularly benefited from the 1977-78 NJTC, increased employment more in the two years than industries dominated by large firms whose participation in NJTC was capped at 48 employees. Reviewing this literature, Daniel Hamermesh concluded, “The evidence on the effect of the NJTC on employment growth is both positive and convincing. The number of jobs created and the total budgetary cost of creating them, are remarkably close to what would be predicted if one applied the best guess estimates of Chapter 3 to the particular incentives offered by the NJTC” (Hamermesh 1993, 192). The expiration of the NJTC at the end of 1978 did not unravel the NJTC’s employment-boosting effects. During the next 12 months, output and employment growth slowed down considerably but the unemployment rate was stable at its lower level and the employment-population ratio remained at its up-to-then record level. Apparently, the temporary character of the NJTC induced some employers to expand now rather than later. When the subsidy ended, the new hires were retained and those who quit were replaced. Then the nation was hit by two oil shocks (caused by the Iranian Revolution and the Iran/Iraq war) and a strong Federal Reserve response (the FRB discount rate reached 13.42% in 1981) to wring inflationary expectations out of the economy. These shocks caused the recessions in 1980 and 1982-83 (Hamilton 2003, 2009). The 1977-78 NJTC had two flaws that reduced both its scale and its cost effectiveness. No firm could claim more than $100,000 in NJTC credits (effectively 48 employees). The other flaw was that the threshold for calculating the 1978 NJTC credit was 102% of the 1977 FUTA (Federal Unemployment Tax Act) tax base. That meant that a firm growing rapidly in 1977 was also raising its threshold for calculating the 1978 credit. This discouraged aggressive expansions in 1977. Both of these flaws have been avoided in our proposed design for the 2010-11 JCTC. How do we know employers will respond to lower wage costs by hiring? The work of Daniel Hamermesh (1993) remains the canonical source for estimates of the responsiveness (or elasticity) of employers’ demand for labor to changes in labor costs when aggregate output is held constant. After examining nearly 100 studies published in refereed journals he concluded: “The absolute value of the constant output elasticity of demand for homogeneous labor at a typical firm and for the aggregate economy in the long run is probably bracketed by the interval [0.15, 0.75], with 0.30 being a good best guess” (Hamermesh 1993, 135). omy like ours, many firms are shrinking employment even while other firms are expanding employment. Some firms that have suffered grievous sales declines (or have lost access to bank loans) will not see a path to growing their employment in 2010 by enough to exceed their FY2009 level and obtain a JCTC subsidy. Our analysis of the BEDS data implies that 38.5% of firms (weighted by employment) will have a lower payroll in 2010 than in FY2009 and therefore will not earn a JCTC subsidy. Since only the subsidized firms will respond, the impact of the JCTC on total private-sector and state and local employment is predicted to be 2.3% [i.e., 3.74% * (1-0.385)]. For 2011 our BEDS model projects that 26.7% of firms (weighted by employment) will still have 2011 taxable payroll below their FY2009 level and will therefore not be able to benefit from the JCTC. 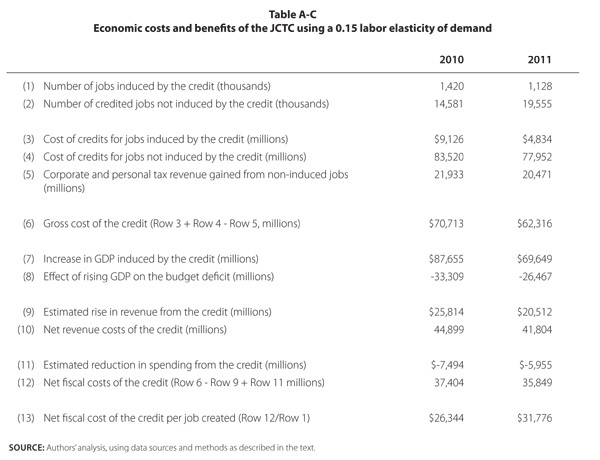 The JCTC is 10% in 2011, so the predicted impact of the JCTC is 1.825% (0.30 * 0.10 * 0.83 * (1-0.267)). What if the labor demand response is lower? Our model can be easily tweaked to change assumptions. We report below results after lowering the labor demand assumption to what Hamermesh identifies as the “lower bound” of estimates: 0.15. Before providing these lower-bound estimates, we should note that the baseline assumptions given above for labor demand responses seem reasonable. It is quite possible that actual labor demand responses will be greater than the baseline, rather than less. However, it seems prudent to consider some downside risks of a revised JCTC under pessimistic assumptions. A labor demand elasticity of 0.15 rather than 0.3 results in job creation that is roughly half as large (compare the results in Table A-C and the results in Table 1). However, creating almost 1.5 million jobs in 2010 would hardly be a trivial effect. A lower demand elasticity also reduces the program’s costs a bit as fewer employer expansions are spurred by the wage credits. The cost reduction is about 10%, to $72 billion in 2010 and $64 billion in 2011. After considering the effects of GDP increases on the budget deficit, the estimated 2010 net fiscal costs of the program are $37 billion and the estimated 2011 net fiscal costs are $36 billion. The net costs of the program per job created are much higher than under the 0.3 scenario but still modest: under $27,000 in 2010 and under $32,000 in 2011. Appendix F shows that the net costs of a JCTC this high are worth pursuing given the estimated social benefits of job creation. There are two principal goals for administrative design of a JCTC. First, the credit should be simple: easy for employers to understand, easy for employers who are actually expanding payroll to claim, and easy for the Internal Revenue Service to administer. Second, the credit should be stringent: it should be difficult for employers to claim the credit unless they are actually expanding employment and payroll. An economist is probably not the best person to design the administrative details of such a tax credit. Better advice might be received by a committee of business tax accountants and federal tax administrators. However, here are our suggestions for such a committee to consider. As previously suggested by Bishop (2008, 2009), one possibility is to base the wage credit on quarterly tax filings made by almost all employers on Form 941. Total Social Security wages are reported by the employer on lines 5a and 5b. These are wages paid to all employees up to the employees’ maximum Social Security-taxed annual earnings of $106,800. We propose primarily basing the credit on the increase in Social Security wages. This keeps the full wage credit for almost all employees but reduces any credits for extremely high-paid employees (including, for example, the owner of the business). Further, we suggest that the wage filings for each quarter be compared with the analogous quarter of the base period. If a credit is passed in the fourth quarter of 2009, the base period would be the fourth quarter of 2008 through the third quarter of 2009. Using the same quarter of the base period has several advantages. First, it automatically adjusts for seasonal variations in employment. We don’t want to provide credits for employers who normally expand employment every summer, or during the Christmas season. In addition, if the employer has a high percentage of highly paid employees, paid more than the Social Security maximum, then Social Security-covered wages will tend to dip in the fourth quarter of each year (or whenever the Social Security maximum covered annual wages and exceeded). By comparing wages paid in each quarter of 2010 and 2011 with the analogous quarter of the base period, the calculation automatically adjusts for this tax-related “seasonality” of reported Social Security wages. Wages paid to the owners or family members would not be counted toward the credit. Finally, we would propose one additional constraint. Employers could receive a wage credit only if their employment was not reduced compared to the base quarter. (This could also be measured using information from Form 941, specifically the information on line 1 on the number of employees for the pay period including the 12th day of the last month of the quarter.) We want to provide incentives for hours increases as well as net additions to employment. However, we do not wish to provide the credit to employers who may increase payroll by increasing work hours while cutting the number of employees. We suggest that the adjustment factor for base period wages be based on the annual adjustment customarily used for maximum Social Security taxed wages. This adjustment was 4.7% from 2008 to 2009. This adjustment in most years reflects changes in average worker wages. We only want to pay credits for payroll increases that go beyond what would be expected if employers’ keep the same employment and work hours, and simply increase wages with average wages. We also don’t want to pay credits for increases in wages covered by Social Security that are simply due to adjustments in Social Security rules for maximum Social Security-taxed wages. We note that Social Security freezes maximum Social Security-taxed wages if the Social Security cost-of-living-adjustment is not increasing. Under current projections, it is possible that maximum Social Security taxable wages will not increase in 2010 and 2011. (See The 2009 Annual Report of the Board of Trustees of the Federal Old-Age and Survivors Insurance and Federal Disability Insurance, pp. 105-108.) In that case, there would be no need to adjust base period wages. In a depressed economy, a wage credit for expanding employment will have economic impacts over and above the direct jobs created. To start, even if aggregate national output were unchanged by the credit, the credit would still encourage greater employment by increasing the average labor-to-output ratio in the economy. Given that fears of a “jobless recovery,” wherein output rises but employment does not, are now (correctly) high, this channel alone could have a nontrivial impact on job growth. ncome is higher than out of other kinds of income (especially profits), then this increase in the wage share will increase aggregate demand for output. It should also be noted that any initial increase in aggregate output will tend to have Keynesian multiplier effects by increasing incomes, which will increase consumer demand. We don’t model these Keynesian re-spending effects in our estimates, which make them quite conservative. Therefore, the general equilibrium response of overall employment to lower wages brought about by wage credits will tend to expand aggregate employment both by increasing the labor-to-output ratio and by expanding aggregate output. Bartik (2001) has shown that these labor demand effects will interact with labor supply to yield the final effect of wage credits. He finds that the labor demand effects will dominate and drive the overall results in high-unemployment economies, such as the one characterizing the United States today. How much is an additional job worth in today’s economy? Adding jobs to the economy provides the monetary benefits of these jobs’ compensation. This averages about $62,000 in today’s American economy. In addition, moving from involuntary unemployment to employment provides an improved sense of self-worth for the individual worker that goes beyond the earnings gained. This improved sense of self-worth corresponds to a high monetary value of obtaining a job. Why might moving from unemployment to employment have such great social value? In part because of the social importance attached to jobs in modern American society. But also, obtaining a job may provide employment experience that may affect a worker’s long-run job skills, employment rate, and wages. Further, reducing unemployment is valuable even to those who remain employed. Reducing the local unemployment rate reduces the risk to the employed of becoming unemployed. It also reduces the unemployment of persons important to the employed, such as their family, friends, and neighbors. Research (Tella, MacCulloch, and Oswald 2001) has shown that, while the effect of a one-point rise in unemployment in reducing life satisfaction is greater per person for the unemployed than for the employed (by about 15 times), because there are many more employed persons than unemployed the aggregate “social cost” of rising unemployment is as much as six times as large as the simple loss to those who lose their jobs. The upshot of all this discussion is that creating a job in a high unemployment economy might easily have a social benefit of $60,000 or $100,000 per job, or even much more. This social benefit is in addition to the earnings gained from the job. It reflects future earnings gained due to extra job experience, the social meaning of employment in American society, and the value of reducing overall unemployment rates to the employed. We note that such social benefits are much higher in a high-unemployment economy. Therefore, the job creation tax credit that we propose is a temporary tax credit that is appropriate in today’s high-unemployment economy. It would not be appropriate as a permanent tax credit that would persist in low-unemployment conditions. Some states also have employer tax credits that purport to create jobs. These frequently are permanent tax credits. Do the arguments we have made for a temporary federal JCTC apply to all of these state-level credits? • Many state-level tax credits are poorly designed. The credits may not be tightly targeted at job creation, or may be haphazardly distributed to employers. • State balanced-budget requirements restrict the effectiveness of such credits.Unlike the federal government, states must finance a job creation tax credit by reducing spending or increasing other taxes. Such measures at least partially offset any economic benefits of a JCTC, and may create other social costs. • A permanent statewide JCTC may not have sufficient social benefits to justify its costs. As discussed in Appendix F, the social benefits of creating jobs are much higher when and where unemployment is high. • State competition for jobs may be a zero-sum or negative-sum game. A state JCTC may attract jobs away from another state with a more depressed economy. This technical appendix explains our model estimating the impact of wage credits for expanding employment. This model is implemented in an Excel spreadsheet, available on request from the authors. A table version of the spreadsheet is presented here (Table A-H). We go through this table line-by-line to explain how the numbers are obtained. The top numbers are the inputs for the model. These inputs are obtained from various data sources or reasonable estimates. Item 1 is wage and salary earnings, excluding federal employees, in the United States in 2008, obtained from Table 6.3D of the National Income and Product Accounts (NIPA) produced by the U.S. Department of Commerce. Item 2 is full-time equivalent (FTE) employment, excluding federal employees, in the U.S. in 2008, from Table 6.5D of NIPA. Item 3 is wages and salaries per FTE employee, derived by dividing Item 1 by Item 2. Item 5 is the default percentage (without the wage credit) of total private baseline employment represented by private jobs created by openings and expansions over a one-year period. This number is needed to estimate the cost of the credit that goes to jobs that would’ve been created even in its absence It is derived from the Business Employment Dynamics (BED) database of the Bureau of Labor Statistics (BLS). BLS reports annual jobs created by openings and expansions of establishments, as a percentage of one-year-ago employment, from the first quarter of 2007 to the first quarter of 2008. This number can be found in Annual Table 2 of the Business Employment Dynamics data, which can be accessed at: http://www.bls.gov/bdm/anntab2_1.txt. Item 6 is the ratio of employment created in openings and expansions over a two-year period (from 2009 to 2011) as a percentage of baseline employment to this percentage over a single year. This ratio is our best estimate in the absence of data. If one-year percentage growth numbers are the same over time, the maximum value for this parameter is two. In general, it will be less than two, because some of the firms that opened or expanded in the first year will close or contract in the second year, and vice versa. Item 7 is the ratio of Social Security wages to total wages. This is derived from Tax Policy Center figures for how much would be raised from eliminating the maximum taxable wage cap on Social Security (see http://www.taxpolicycenter.org/numbers/displayatab.cfm?DocID=1816 and http://www.taxpolicycenter.org/taxfacts/displayafact.cfm?Docid=46&Topic2id=50). This ratio is used to reduce credit costs, as only wages up to the Social Security cap are assumed to receive a wage credit. Item 8 is the assumed labor demand elasticity. It is assumed to be 0.3 in the baseline simulation, based on Hamermesh (1993, 135). In Appendix C, we use the lower-bound value identified by Hamermesh (0.15) to model a “pessimistic” scenario for the wage credit. Item 9 is the proportion of the wage credit that is immediately recaptured by higher taxes on business profits. It is only calculated for wage credits paid to job creation that would have occurred without the wage credit. Item 9 reflects that the wage credit directly raises a private for-profit employer’s profits, which will also raise its taxes. The question is what tax rate to use for this calculation. After some reflection, we rejected using effective business tax rates, as these typically are calculated for capital expansions financed by some combination of debt and equity. In contrast, here we are considering a wage credit that is largely assumed to not affect capital, but only to induce employment expansion. Therefore, it seemed appropriate to use the actual statutory rate faced by the business owners. We used the top corporate tax rate of 35% for corporate profits, and the top individual tax rate of 27% for non-corporate profits. A weighted average was calculated of three possible tax rates: 35% for corporate profits; 27% for non-corporate profits; zero for non-profit organizations and state and local governments. The weights used in this calculation were the proportion of wages and salaries of each of these sectors in non-federal wages and salaries, calculated using Tables 6.3d and 1.13 of NIPA. Item 10 is the proportion of total non-federal employment that is assumed to be potentially affected by the wage credit during the first year, 2010. This is based on one minus the proportion of private establishments that contract or close during a one year period. That is, the proportion that is calculated is the proportion of establishments that either stay the same, open, or expand during a one-year period. These data are obtained from Table 4 of the annual growth data from the Business Employment Dynamics database, available at http://www.bls.gov/bdm/anntab4_1.txt. This calculation implicitly assumes that the employment that is potentially affected is proportional to the private establishments that are potentially affected. This may not be perfectly accurate because firms are not the same as establishments, because firms and establishments of different sizes may have different probabilities of growing or contracting, and because the average experience of all non-federal employment may not be the same as that of private employment. Item 11 is the proportion of total non-federal employment that is assumed to be potentially affected by the wage credit during the second year, 2011. This proportion will be larger than the proportion in the first year. During the second year, employers that opened up or expanded during the first year will be potentially affected by the credit, even if they would have contracted without the credit during the second year, as their employment decisions during the second year potentially will affect the credit they receive. The credit received is based on payroll and employment relative to the base year of 2009, rather than relative to 2010. To calculate this proportion, we assume that only establishments that contracted during the first year would not be affected by the wage credit. Item 12 is the ratio of the dollar reduction in the budget deficit to a given dollar increase in gross domestic product (GDP). These data are derived from U.S. Congressional Budget Office data on the cyclical component of the budget deficit and data on potential versus actual GDP. We obtained these data for fiscal years 1969 to 2008 in Tables F-11 and F-12 from a Congressional Budget Office Excel workbook titled “Historicaltables09jun09web.xls,” and they are downloadable from “Historical Budget Data” link at the Web page for “A Preliminary Analysis of the President’s Budget and an Update to CBO’s Budget and Economic Outlook” (March 2009), available at http://www.cbo.gov/doc.cfm?index=10014. Item 13 is the assumed tax credit percentage for 2010 of 15%. Item 14 is the assumption that the tax credit percentage for 2011 will be two-thirds as great, at 10%. Items 15 through 23 use these data and behavioral and policy assumptions to predict the effects of the wage credit. Item 15 is predicted wage credit costs for the openings and expansions that would have occurred even without the wage credit. This is derived by multiplying total non-federal wages and salaries by the percentage openings and expansions are of base employment over a one-year period times the tax credit percentage. This is then downweighted by multiplying the wage credit percentage times the ratio of Social Security wages to total wages, as the wage credit only applies to Social Security wages. The cost is also downweighted by the wage credits that will directly lead to higher tax revenues from business profits, even if the tax credit has no behavioral effects. Item 16 is the employment increase estimated to occur due to the wage credit. This multiplies total base employment times the assumed percentage of employment that is responsive to the credit times the tax credit percentage times the assumed elasticity of labor demand. There is downweighting of the effects by multiplying this expression by the ratio of wages to compensation: the assumption is that the demand elasticity reflects a responsiveness to percentage changes in compensation, and since the wage credit is a percentage of wages, its percentage effect on compensation will be smaller. Item 17 is the wage credit costs for these induced jobs in item 16. This multiplies the number of induced jobs times average wages per job times the ratio of Social Security wages to total wages times the wage credit percentage. Item 18 totals the wage credit costs for the first year by adding up wage credit costs for induced jobs, and for jobs that would have been created without the credit. Item 19 calculates the ratio of wage credit costs to induced jobs, which divides estimated costs in item 18 by estimated jobs created in item 17. This is one measure of the effectiveness of the wage credits. Item 20 is an alternative measure of effectiveness. It calculates total jobs that receive wage credits, divided by jobs actually induced by the wage credits. The number of jobs directly induced by the credits has already been reported at item 16. The number of other jobs that receive credits is calculated by multiplying total baseline jobs by the assumed percentage of jobs created by openings and expansions. It is interesting that the tax credit costs per job created are modest, at $28,116, even though less than one in five jobs that receives credits is actually induced by the wage credit. This program does not need to have a very high hit rate to be successful. Item 21 calculates the reduction in the budget deficit due to the induced jobs. This multiplies the increase in GDP times the negative of the ratio of the budget deficit effect to GDP, from CBO. The increase in GDP is calculated by multiplying the induced jobs by average compensation per job. The implicit assumption is that capital is held constant. If we assumed capital investment also changed in response to the wage credit, the effect on GDP would be much greater. Item 22 calculates the net costs of the wage credit program, including the effects of the program itself with no behavior effects, and the effects due to the program’s effects in increasing GDP. Item 23 divides this net cost by the number of jobs created to get a net cost per job created number. Items 24 through 32 do similar calculations for the second-year numbers. All the calculations are analogous, except some of the numbers used are updated for the second year. For example, the measure of costs for growth that would have occurred anyway, in item 24, compared to item 15, the percentage of openings and closing over the two-year period is larger, which tends to increase costs. But also the percentage wage credit is assumed to be lower, which reduces costs. For the induced employment increase for the second year, item 25, compared to the same concept for the first year (item 16), a higher percentage of employment is assumed affected, which drives up the employment effect, but the wage credit percentage is lowered, which reduces the employment effect. Similar adjustments are made to the other calculations in items 24 through 32. 1. Other policies should also be adopted to boost job growth, chief among them extensions of many of the provisions of the American Recovery and Reinvestment Act. These include policies to boost demand, including extending public relief programs such as unemployment insurance and food stamps. In addition, increased direct aid to states would help prevent layoffs of public employees, which would ripple through local economies and destroy private sector jobs as well. 2. These are responses to permanent wage changes. We might expect responses to temporary wage changes brought about by a wage credit to be smaller. On the other hand, the labor demand responses estimated by Hamermesh are really responses of labor demand holding the firm’s output constant, or, in other words, they are changes in the labor/output ratio. Wage credits would be expected to increase both desired labor and desired output of an employer. 3. What about the value of foregone leisure? This may be relevant when considering an economy with low unemployment. However, we are here referring to involuntary unemployment. We note that the high valuations on moving between unemployment and employment estimated by researchers on happiness determinants are net of any valuation of leisure. 4. These valuations rest on comparing how happiness is affected by small marginal changes in income with the effects of discrete changes such as becoming unemployed or widowed. Individuals may not be willing to pay the full amount implied by these valuations for a discrete change from unemployment to employment. However, collectively a group of individuals may be willing to pay relatively small marginal valuations to reduce the risk of one of them becoming unemployed, and these collective small valuations might sum to these large aggregate valuations of reducing unemployment by one person. If these valuations are valid, why don’t individuals further bid down wages? Among other factors, part of the social value of a job may be associated with the job paying a wage perceived as fair and normal. Akerlof, George, and Robert Shiller. 2009. Animal Spirits. Princeton, N.J.: Princeton University Press. Bartik, Timothy J. 2001. Jobs for the Poor: Can Labor Demand Policies Help? New York, N.Y.: Russell Sage Foundation. Bernstein, Jared, and Lawrence Mishel. 2008. “Reading the Vital Signs in the Jobs Report.” Issue Brief No. 243. Washington, D.C.: Economic Policy Institute. Bishop, John, and Robert Haveman. 1979. “Selective Employment Subsidies: Can Okun’s Law Be Repealed?” American Economic Review Papers and Proceedings, May: 124-30. Bishop, John H. 1981. “Employment in Construction and Distribution Industries: The Impact of the New Jobs Tax Credit.” In Sherwin Rosen, ed., Studies in Labor Markets. Chicago, Ill.: University of Chicago Press. Bishop, John H. 2008. “Can a Tax Credit for Employment Growth in 2009 and 2010 Restore Animal Spirits and Help Jump Start the Economy?” Cornell University ILR School. Available: http://digitalcommons.ilr.cornell.edu/articles/184/ (accessed: 30 September 2009). /242/ (accessed: 30 September 2009). Blanchflower, David G., and Andrew J. Oswald. 2004. Well-being over time in Britain and the USA. Journal of Public Economics, 88: 1359-86. Hamilton, James D. 2003. What is an oil shock? Journal of Econometrics, 113(2):363-98. Hamilton, James D. 2009. “Causes and Consequences of the Oil Shock of 2007-08.” Paper presented at Brookings Institution, Washington, D.C., April 27. Hamermesh, Daniel S. 1993. Labor Demand. Princeton, N.J.: Princeton University Press. Perloff, Jeffrey J., and Michael L. Wachter. 1979. The new jobs tax credit: An evaluation of the 1977–78 wage subsidy program. American Economic Review, 69(2): 173–79. Phelps, Edmund. 1972. Inflation Policy and Unemployment Theory. New York, N.Y.: Norton. Tella, Rafael Di, Robert J. MacCulloch, and Andrew J. Oswald. 2001. Preferences over inflation and unemployment: Evidence from surveys of happiness. American Economic Review, 91(1): 335-41.